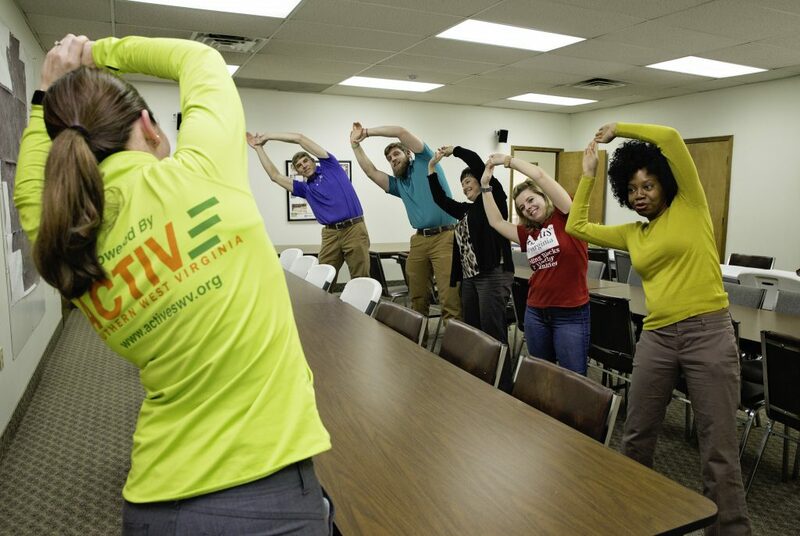 With Try This minigrant and Second Stage grant help, Active Southern West Virginia is spreading healthy workplace activities to offices all over the southern half of the state! One of the staples: a simple three-minute Stretch-and-Move break! This page is loaded with WV specific community resources and examples of ways you can make healthy changes in your own worksite. Workplace Wellness – Why Do We Care? The WV Addressing Obesity and Related Chronic Disease details the burden, health goals, and proven strategies to reduce obesity and improve health indicators. West Virginia has one of the highest adult obesity prevalence rates nationally, with 37.7% of West Virginia adults who are obese (2016). Try This WV is doing something about this through proven strategies in community settings and in worksites. Since most full-time working adults spend a majority of their time at work, effective workplace programs and policies can help reduce obesity and improve chronic disease outcomes. “One major driver in the focus on chronic disease prevention and wellness is economic. Simply put, healthy people cost less to employ and are more productive. Thus, employers are becoming increasingly interested in promoting health in their workforces, through both formal workplace programs and organizational cultural change.” John Yauch, WV Department of Health and Human Resources, Workplace Physical Activity Policies in West Virginia Report. Improve healthy behaviors, increase physical activity and encourage healthy eating. Improve workers’ health knowledge and skills. Create a culture of healthier behaviors at work. A study showed these programs increased employee retention, attendance, productivity and improved employees’ quality of life. Obesity and related chronic disease cost money, impacts health cost to employers and employees. A 2010 medical survey revealed the U.S. spends over $1 trillion a year on medical cost and 86% of the cost is associated with heart disease, stroke, cancer, arthritis, diabetes or obesity. According to the CDC, the U.S. spends $225 billion annually on personal and family health problems including indirect cost of absenteeism, poor, health and disability. All these reasons provide more than enough justification for addressing wellness where people work to improve health. Together we can continue to address obesity and chronic related disease and get WV off the worst health list by using proven workplace strategies! Many WV organizations are partnering to improve workplace wellness–including Try This Mini-Grant Recipients. KISRA increased CDC Worksite Health CDC Worksite Health ScoreCard (HSC). Staff that said they enjoyed the American Heart Association Mobile Kitchen Cooking Classes and showed excitement after cooking delicious healthy meals with less sodium & learning how to monitor BP. The cooking class was featured in local news. 30% said they appreciated the Lunch & Learn topics (i.e. Walking Groups, Know Your Numbers & Portion Control) and provided knowledge on wellness. KISRA developed and shared healthy meeting food and beverage pledge. 70% of employees participated in the NRG workplace program. 60% of employees participated in campaign log (includes numbers of steps). 50% of employees participated in the health fair. Developed a workplace wellness “how to guide” based on best practices and lessons learned that employers can use to improve employee health. Shared sample wellness program materials including: employee communication letter to staff informing them of wellness program, Wellness Program and Acknowledgment and Informed Consent and Release Form, Sample Letter of Support for Mini-Grant, Set a Good Example Contract; Food and Beverage Pledge, Healthy Meeting Checklist, and Photo Release Form. Adopted CDC’s assess, plan, implement, and evaluate workplace framework and physical activity strategy. Convened key physical activity stakeholders. Developed physical activity survey and 21 Free motivational physical activity posters which are free to download online for display in key settings to promote physical activity where individuals eat, live, work, play, and pray. Developed an online Active Southern WV Workplace wellness Program and Workplace Wellness Starter Kit. Developed online Workplace Wellness Tools webpage. Click on the image to download even more posters to display at your workplace! How you can create and do workplace wellness on a shoestring budget? Additionally, there are many worksites both big and small, who are eager to start and or expand their existing program! Your organization isn’t alone. The Division of Health Promotion and Chronic Disease well@work WV Healthy Worksite Initiative has outlined simple proven method steps to help you get started. The Division utilizes the CDC Workplace Health Model and CDC Workplace Resource Center, additional resources for implementing effective workplace wellness strategies. Review: familiarize yourself with well@work WV Healthy Worksite Program resource section and Workplace Health Program Definition and Description. Assess: Complete and submit the organizational assessment–CDC Worksite Health ScoreCard (HSC) paper or online. Plan: Develop a Health Improvement Plan (Word Doc) (PDF) with at least one Specific Measurable Attainable Realistic Timely (SMART) objective based on CDC HSC results. Implement: Use the well@work WV Healthy Worksite Initiative resources to take action and Try This Set A Good Example Resource for Action. If you are not sure where to start, consider physical activity and nutrition strategies. Feeling good about wellness? Apply for workplace wellness recognition. Set a good example. At Try This we have implemented some innovative, informative and always fun workplace wellness practices not only for our staff, but also for those who visit. Our cuckoo clock in the office is set to go off every 30 minutes, no matter where you are, what your doing, or who is there, everyone gets up and moves and stretches. This gets the blood circulating, gets your heart rate up, and is always a good time watching everyone run around the office. We have signs up around the office motivating staff to be active and reminders and tips to stay healthy. Post recipes up in lunch/break rooms with examples of healthy food and snack alternatives. Have pot lucks on special occasions or for big meetings where everyone brings a healthy dish and swaps recipes. During cooler months at the office, Try This hosts a Yoga hour for lunch. Let people from the community or other business join in for even more fun. We chose to offer it FREE for staff and charge $5 for anyone in the community to participate. 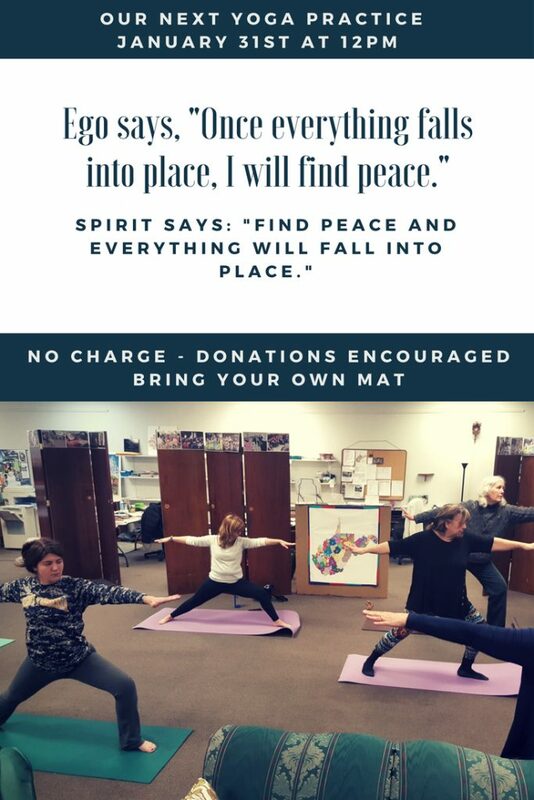 Weekly Yoga class offered for the Try This Staff and community members. Want 121 Employee Wellness Program Ideas Your Team Will Love? Download the PDF here.